Data hold more potential than ever before to shape the lives and living conditions of children. This is why it is crucial that UNICEF approach its data work with an understanding of both what it means to unleash the power of data for children and our own role in that process. By defining key principles for our data work, this strategic framework is the first step in doing just that. 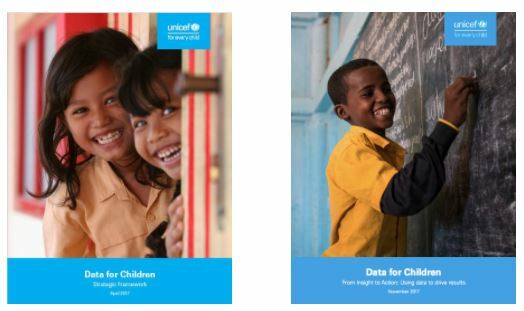 It is designed to provide a broad overview of how UNICEF thinks about data for children and to lay out initial steps – already underway in numerous countries – for reorienting our investments. Since releasing this framework, UNICEF has rapidly expanded its commitments in three areas that are essential for good data work: coordination coordination, strategic planning, and knowledge sharing. Through the newly-established Task Force on Data, UNICEF colleagues are now working better, together. In a diverse range of pilot offices, UNICEF teams are engaging in a new strategic planning process, aimed at identifying the most impactful data-related investments. A new internal website and community space now offer UNICEF data enthusiasts and practitioners a place to learn from each other. The brief entitled, From Insight to Action: Using data to drive results, is part of those efforts to make the case for strategic, action-oriented data work. It includes five examples of how UNICEF and its partners are using data to tackle problems ranging from effective messaging in a public health emergency to getting children back to school after they have been displaced by violence.